This article is for those who want to get bigger arms. To get bigger arms you must train your bicep and triceps muscles. Most people who want bigger arms make the mistake when trying to get bigger arms by concentrating on the biceps muscle. They waist there time by doing countless reps and sets of bicep curls. The best place to start to get bigger arms quickly is by concentrating on the triceps muscle. This is because the triceps muscle makes up two thirds of the upper arm!!! The triceps muscle is made up of three parts a long head which originates at the scapula, a lateral head which originates at the back of the arm (humerus) and the short head which originates on the humerus a bit lower than the lateral head. 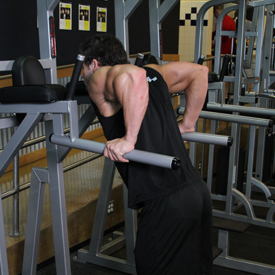 The triceps muscle is utilized in all pushing exercises. But as I mentioned earlier to get bigger arms alot times weight lifters will focus on bicep curls. This is not a good way to get bigger arms because the bicep only makes up one third the total size of the upper arm. To get bigger arms you must target the triceps muscle. When people ask me how to get bigger arms I tell them just one exercise "dips." Do dips and do a lot of them. I also warn them whenever you want to build muscle fast in a single area to stay away from isolation type exercises that target that area. Isolation type exercises will not build muscle fast and will do very little to increase the size of the muscle. To get bigger arms and to build muscle fast, you must focus on compound exercises that targets the triceps and biceps muscles. Let me explain.... to get bigger arms fast dips is the best and I speak from experience!! Think about this....have you seen the tricep muscles on male gymnasts? The dip exercise is basically the only true triceps exercise they do and they all have absolutely huge, thick, muscular triceps. Not to mention gymnasts are cartoon like in their muscularity. That is because of the type of exercises they do to get bigger and stronger. Whenever you use your bodyweight for resistance and or bodyweight plus additional resistance while performing a compound movement you activate a greater number of muscle fibers than you would if you simply used a machine. Machines do not recruit as many muscle fibers particularly the muscle fibers that are responsible for stabilization. 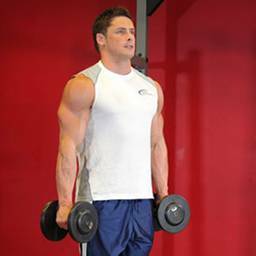 To get bigger arms and to build muscle fast whenever possible you want to try to move your body instead of simply moving the arm or an attachment on a machine. Although free weight exercises are very effective and a much better option than training on a machine, moving your own body will always be best when trying to get bigger arms. Dips can be done on parallel bars, dip station or if you are really advanced gymnastics rings. There are diagrams of the best exercises to get bigger arms below but lower yourself no lower than the point where your triceps are parallel with the ground when doing dips. Going lower than this puts unneeded stress on your shoulders and it is not worth the risk of a severe injury.To get bigger arms and build muscle fast its kinda difficult to do this if you are injured. Dips can be done three times a week . After just a couple of months you will definitely see why dips is the best exercise to get bigger arms. As you get stronger and more advanced I recommend to cut your dips down to twice per week and to add resistance. I love weighted dips and did them routinely with two 45 pound plates strapped around my waist. However, I have found that there is a high risk of injury with weighted heavy dips. Because of this I no longer do heavy weighted dips its just to risky!! Intermediate lifters can do one day heavy, where you add resistance to your weight belt, and one day light where you simply do as many reps as possible till failure. These workouts should be a minimum of 3 days apart but more like 4 days apart. Once you get strong enough to do a 45 pound plate for safety reasons you probably will only want to use weighted dips as a rep exercise and not a heavy strength movement anymore. Again, this is to prevent injury or any disability as you age. The next exercise to get bigger arms and build muscle fast in the triceps is a reduced range of motion bench press or a variation of it. 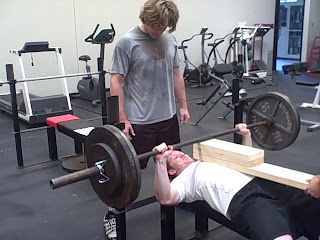 The top half of the bench press really targets the triceps which is why you want to limit the range of motion when training simply to get bigger arms. 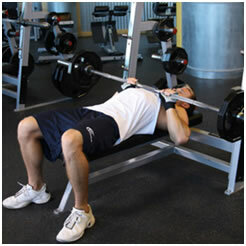 To do this you can set pins in a power rack or have a workout buddy hold a few two by fours on your chest. These are called board presses. Three, four and five board presses are awesome to build muscle fast and get bigger arms by building huge triceps and should be added to your muscle building routine. When you get too strong to go heavy on dips without risking a shoulder injury, make board presses your heavy triceps movement and dips your light triceps exercise to get bigger arms. Looking for a bigger bench? How about a stronger lockout? Another reason to add board presses to your routine is because it will add strength to your bench press!! Board Presses have been a staple exercise in the power lifting game for many years yielding results ranging from personal to world records. Stick to these muscle building tips and you will get bigger arms and build muscle fast in your arms. Just keep pushing up the weight and reps and before you know it you will have some of the biggest triceps around!! So to get bigger arms lets now move on to the biceps muscle and discuss the exercises which are best to get your arms bigger. The biceps muscle anatomically known as the biceps brachii are comprised of two heads the short head or outer biceps and the long head or inner biceps. The biceps comprise one third of the upper portion of the upper arm and are used in all pulling movements. The best exercises to target and build bigger biceps and bigger arms is Pull-ups. 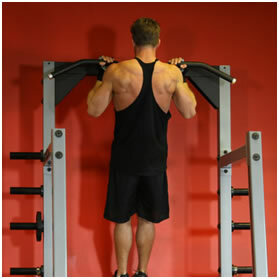 If you are not strong enough to do pull ups you can do lat pull downs. The head that is responsible for the peak in the bicep when flexed is the brachialis head. You can hit all heads of the bicep by varying your grip while doing pull ups and or lat pull downs. Doing pull ups with a under hand close grip hits the long head of the bicep while doing a pull up with the grip variation between an overhand and under hand grip will hit the short head of the bicep which again is responsible for the peak in your biceps when flexed. To get bigger arms a trick I use to hit the biceps hard is to do underhand pull ups or lat pull downs with an underhand grip and as soon as I complete a set do Hammer curls. Hammer curls really hits the brachialis head which again is responsible for the peak in your biceps. Again the best way to build muscle and get bigger arms is by doing compound exercises because your body and muscles work best and harder when used together. The reason why compound exercises are best is because there is more nerve activity involved while performing the exercises the more nerve activity equals more muscle fibers being used in performing the exercise the more muscle fibers used the more growth you will get!!! To prove this point just think what happens to the muscles when ever there is some type of nerve injury. For example anyone with a sciatica condition knows this all to well. As soon as you have this condition what ever leg is affected muscle atrophy is almost instantaneous!!! When there is no nerve signals to the muscle the muscle starts to lose strength and size almost immediately. This is why compound exercises are best to get bigger arms and get bigger muscles. Pull ups puts a huge demand on your biceps and they work several muscles at the same time and force you to pull your own weight. Below are the exercises I recommend to get bigger arms followed by a recommended workout routine!!! Now, inhale and slowly lower yourself downward. Your torso should remain upright and your elbows should stay close to your body. This helps to better focus on tricep involvement. Lower yourself until there is a 90 degree angle formed between the upper arm and forearm. Then, exhale and push your torso back up using your triceps to bring your body back to the starting position. Repeat the movement for the prescribed amount of repetitions. Make sure that - as opposed to a regular bench press - you keep the elbows close to the torso at all times in order to maximize triceps involvement. After a second pause, bring the bar back to the starting position as you breathe out and push the bar using your triceps muscles. Lock your arms in the contracted position, hold for a second and then start coming down slowly again. It should take at least twice as long to go down than to come up. Repeat the movement for the prescribed amount of repetitions. When you are done, place the bar back in the rack. Caution: If you are new at this exercise, it is advised that you use a spotter. If no spotter is available, then be conservative with the amount of weight used. Also, beware of letting the bar drift too far forward. You want the bar to fall on your middle chest and nowhere else. Now, while holding your upper arm stationary, exhale and curl the weight forward while contracting the biceps. Continue toraise the weight until the biceps are fully contracted and the dumbbell is at shoulder level. Hold the contracted position for a brief moment as you squeeze the biceps. Tip: Focus on keeping the elbow stationary and only moving your forearm. Variations: You can also perform this movement using an E-Z attachment hooked to a low pulley. This variation seems toreally provide a good contraction at the top of the movement. 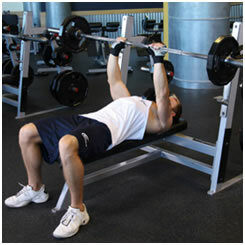 Now, keeping the upper arms stationary, exhale and curl the weights while contracting your biceps. Continue to raise theweights until your biceps are fully contracted and the dumbbells are at shoulder level. Hold the contracted position for a brief pause as you squeeze your biceps. Sit down on a pull-down machine with a wide bar attached to the top pulley.Make sure that you adjust the knee pad of the machine to fit your height. These pads will prevent your body from being raised by the resistance attached to the bar. Grab the bar with the palms facing forward using the prescribed grip.Note on grips: For a wide grip, your hands need to be spaced out at a distance wider than shoulder width. For a medium grip, your hands need to be spaced out at a distance equalto your shoulder width and for a close grip at a distance smaller than your shoulder width.